Very nice, well managed, clean mature campground. Store is stocked very well with lots of experience in what campers need. Lots of space at most sites and the mature growth between sites gives you privacy. The small limbs of new growth that extend over your camper directly in your "space" could be trimmed back a little more often as this is a path for ants and bugs. The sites are a fine crush run type gravel that really cause a mess with your shoes and in your campers...especially if it's raining and wet, as it was during our stay. This is the only negative I experienced and it's something they could and should upgrade with the steady income they experience. Bathrooms and showers are first class, as they have just been completely remodeled. Water tends to stand around the area when raining but this is the coastal flats region and to be expected. Take lots of bug repellent and burn citronella candles at night. Roads are excellent...off leash dog park is one of a kind and activity areas are great for kids. take your bikes...you can ride for miles on perfectly managed path throughout the park. I will return!! Beautiful park with most sites shaded and roomy. The restrooms and laundry were being renovated, but we were warned about this when we made our reservations and given a discount for the inconvenience. Shuttles to Charleston and the beach are provided for a fee. We came back for the Xmas lights and we were not disappointed. We have stayed here before and have always enjoyed the downtown scene. Plenty of places to visit in and around the area. The site was clean and level. The bathrooms were nice with laundry. The walking and bike paths are great. Would recommend this campground and will be back in the future. My wife and I have this CG as #1 on our list of Fav's. Stayed here for total eclipse, very good level sites with full hook ups and WiFi. Staff very friendly and helpful, perfect location for site seeing Charleston, we utilized their shuttle service to get to and from Charleston which was excellent as well as free bus service once you are in Charleston. Would recommend to anyone and would definitely stay here again. 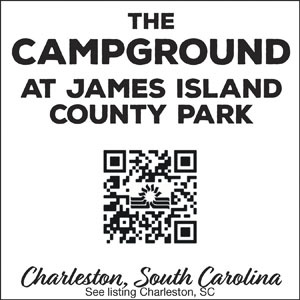 Second time and has proven to be THE campground for visiting Charleston. Short drive to Folly Beach, downtown Charleston, and growing retail-commercial area, all less than 10 minutes from the campground. Sites are close but segregated and private. Bathhouses are not A/C (didn't use). Park has waterpark, hiking-bike trail, fishing and dog park. Unusually good County Park! Good sites, mostly level, quite private. Very clean Bath House. cleaned at least twice daily. The park itself is very impressive. 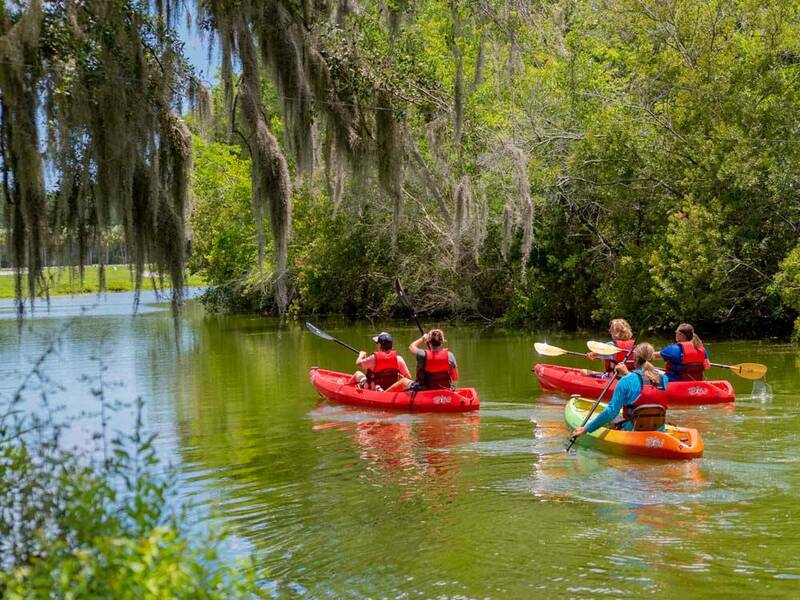 Lots of locals use it because of: 1) Outstanding Water Park, complete with Lazy River 2) Great recreational lake for kayaks, canoes 3) the Outdoor Zone, a fully equipped rock climbing wall, a ropes course, slack-line course 4) Great bikepath/trail system It is very close to downtown Charleston, and there is a $10 Round trip shuttle to take you into town. I love this place! This is our type of campground. The campground is inside the park. The park close at 8:00. There is no outside traffic except for campers that can go in and out after hours. They give campers a code to use. A lot of the sites are surrounded by trees/bushes so you have privacy. Most are very spacious. We had two different sites when we stayed. One was pretty level, the other was a little off, but not too bad. It is very quiet during the week in the campground. I understand that they are very strict on their Quiet Time rules, which is fine by us. The park is beautiful, with plenty of bike/hiking paths. The lake is pretty. There is plenty to do at the park itself. The campground and park is very pet friendly. To understand how much we liked this campground...we arrived on a Sunday, supposed to leave on Wednesday and head on down to Savannah. After an hour, we requested to stay all week. The staff was very helpful. We had to move to another site, but that was ok.
A Great camping experience each and every time we visit. Wonderful Festival of Lights for Christmas. Third year and have already made reservations for next November. Of course, we will be visiting in the spring and summer. Close to beaches and great bicycle paths all around the park! Very nice facilities. We stayed during Christmas week and throughly enjoyed the lights and displays. The staff was very helpful and friendly. We plan on making this our new Christmas tradition! Centrally located to downtown Charleston. Very pretty campground with nice spaces. Restrooms clean with nice laundry facilities. Friendly staff. We would go back. 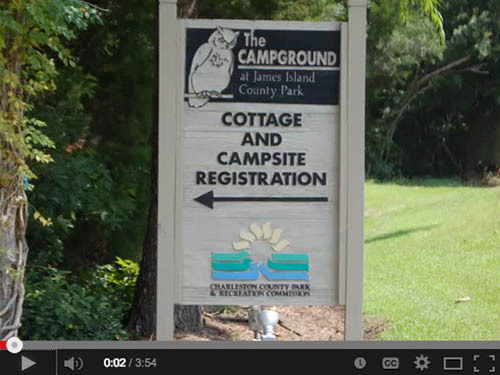 The Campground at James Island County Park is celebrating 50 years! Bring your RV or rent a cottage to enjoy family time at the Water Park, Climbing Wall, Challenge Course and more! Plenty of space for the whole family! From jct of I-26 & US 17 (exit 221A): Go 2 mi W on US 17, then 1-1/2 mi S on SC 171, then 1-1/2 mi W on SC 700, then 1-3/4 mi S on Riverland Dr (R).